This week has a lot of free games: OSR, minimalist, and/or solitaire games. We also have an OSR mixtape, game aids, and more. Bookkeeping Notes: I may get commissions made through the Onebookshelf links in this post. 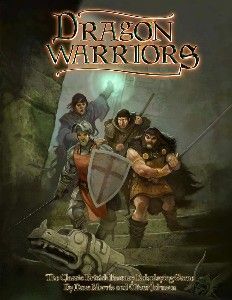 The British RPG Dragon Warriors is now free as a PDF. Dragon Warriors was originally published in 1985 as six booklets. This is the revised edition from 2008 with errata. Charles Atkins writes a blog post series about Dragon Warriors on his blog. I played it once and it is definitely clunky. But charming at the same time and the setting is awesome British-colored fantasy. BLOGS ON TAPE is an OSR audio mixtape. Say what? Well, some folks recorded interesting OSR posts as audio books. Give them a listen. I am Kevin Crawford, author of Stars Without Number. AMA. Kevin Crawford puts out wonderful OSR products with excellent sandbox content. If you're interested in sci-fi OSR or self-publishing, you might want to read this. Matt Jackson wrote another mini game. S.F.S. is a freeform rules-lite RPG. USR 2.0 (Unbelievably Simple Roleplaying) (PWYW) is another simple game that just works. Domino Writing has a Roundup on USR Settings. I'm not sure if it's for you but here is the Weekly Indie RPG & Storygame Review Week 31, 2017. Tina Trillitzsch also mentions this blog. Yay! Game Chef sounds interesting. And I totally missed the Indie RPG Awards. Untold is an “emergent” storytelling game. Every player has their own character, but is also closely involved in telling the story, taking on a author’s or director’s hat as well. It is GM-less (or rather GM-ful), is setting-neutral, meaning you can play in any kind of world or epoch you want, and there is no preplanned plot - the story emerges during play based on your own interpretation of a set of nine Story Cubes (a basic set will come with game, along with a set of Batman cubes for backers, which were a stretchgoal). It's like Ocean's 11 or Leverage, but you know, raccoons. Trash Pandas started as a 200 Word RPG in 2017. IMPROVisr 4.0.0 is a "java application designed to generate tabletop RPG material as an improvisation tool for the game master. Everything from encounters to treasure hoards to NPC’s to random items is but a click away, so the GM can spend their creative efforts fleshing out their game notes rather than smacking into a big wall of writer’s block.". Free. GM's Monthly Miscellany: August 2017 is a free Pathfinder supplement. Although it says PF on the tin, it is useable for other games as well. 35 (and Counting) Solitaire Roll-And-Write Games Are Now Available for Free, as Part of the 2017 GenCan'T Design Contest. This year, GenCan't held a design contest to produce a game for people who can't get to GenCon. The guidelines were to make a solo roll-and-write game. The winning title is getting a graphics overhaul, so it isn't available yet, but many of the other entries are now available to download and play. Hall of the Dwarven King is a dice game for one player. Each of your seven dice represents the whims of one of your followers, Sometimes they'll feel like mining or building, but just as often, they'd rather drink or get into fights. Crowdfunding Collection #49 by Teylen. I'm pondering Stars Without Number: Revised Edition. Kevin Crawford has never let me down. His track record is top-notch. Still, I don't need more OSR games. Friday Grab Bag: Scarlet Wake, Empires of Aranna, Game Design, Etc. Written by Sophia Brandt. Theme by Pete Watson-Wailes.